City polls indicated 81% support for building a new indoor pool in Westmount. 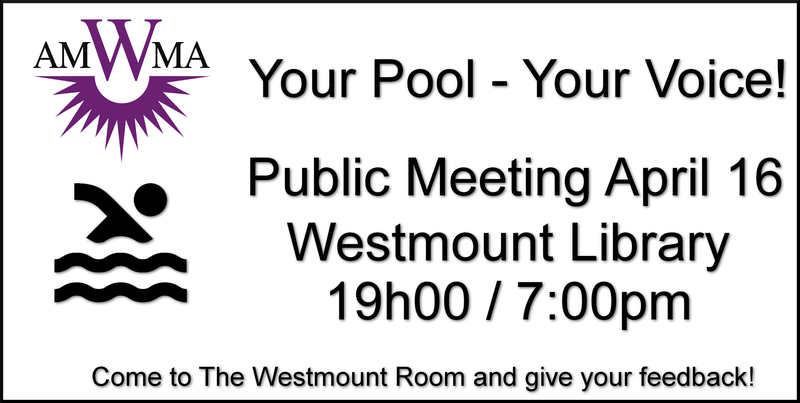 The WMA is organizing a public meeting on April 16th at 7:00pm in The Westmount Room in the Library in order for residents to express their opinion as to what sort of pool to build and where to build it. Come and join the discussion and add your voice to the debate. For anyone who cannot attend the meeting, you can send your comments to president@wma-amw.org. Comments on our blog are disabled due to previous abuse, but we are happy to receive emails.